The toll the Great War had on some families and communities was tremendous. The experience of ‘Pals’ units sent into action together with heavy losses, leading to deep mourning among their friends and relations at home, is well known. Similar stories played out on a smaller scale, as in the case of the Sanger family from South London. John James Sanger and his wife Mary had fourteen children, of whom eleven survived childhood. In 1901, they lived with ten of those children at 44 Camden Grove North, Peckham (now Cronin Road). 20 year old John James junior was a tin plate worker like his father; two more children daughters were in work, Sarah (19) as a button-hole cutter and Florence (17) as a laundress. The other children were all 15 or younger, in descending order: Caroline, Martha Jane, Louisa, William Albert, Frederick, Arthur Ernest and the youngest was Bertram Ernest, only 11 months old. By 1911 all bar Florence and the youngest five children had left home and the (now smaller) family lived at 31 Reaston Street, New Cross. Only ten year old Bertram was still at school: Florence (now 27) was a machinist, William Arthur (19) a machine engineer, Frederick (18) a haberdasher, Arther Ernest (16) a general labourer (no occupation is stated for Louisa). When the war came, the younger Sanger boys joined up. Bertram was too young and does not appear to have served (at least not overseas). William, Frederick and Arthur all joined the London Regiment. Into the same regiment also went George Rose, the brother of William Sanger’s fiancée Emily Rose. The Roses were also from South East London, living in 1911 at 36 Kings Road, Peckham. Emily was a 22-year old waitress in a restaurant and George was a gas-fitter. 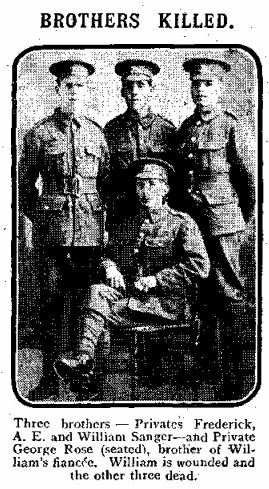 The four men all joined up in Kennington and given that Arthur, William and George were given consecutive service numbers (2396, 2397 and 2398 respectively) it seems likely that they all joined up together on September 2nd 1914, at the height of the recruiting boom. Frederick ended up with a higher number – perhaps because he joined later on. Sometime after they joined up, the men posed for the camera in their uniforms. The attack by the 142nd Brigade on the German trenches, known as the “S” bend, north-east from Givenchy, was to be made at 6.30 p.m. on May 25th, and was to precede an attack by the Canadians farther north at 9 p.m. ; and it was the first big attack in which the Division took part. From the trenches on the left, near Le Plantin, the present writer saw that attack by the 142nd Brigade. The 21st Battalion was in support, and the first advance was made by the 23rd and 24th London Battalions, who swept across the open ground just like a field-day attack at St. Albans [where the division had trained], and at once captured, with comparatively small losses, the German trenches opposite to them. But they then encountered a fierce and deadly enfilading fire from the German guns, and particularly from a heavy battery posted near Auchy-les-la-Bassee, far to the south and out of reach of the guns of our Division. Over 900 men in the 142nd Brigade became casualties that afternoon; as Maude recounted “The 142nd Brigade suffered severe losses in this affair, and by the evening of the 26th their fighting strength was reduced to 1,225 in all.” A Brigade should have contained around five thousand men. Over their ten days in the battle the 47th Division suffered 2,355 casualties. Leonard Keyworth survived and earned the Victoria Cross for his bravery there on 25 May, throwing grenades for 2 hours. The Sangers brothers and George Rose were not so lucky. 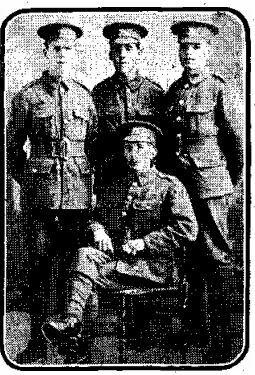 George Rose and Arthur Edward Sanger died on 26 May, two of at least 132 men of the 1/24th Londons who died on 25-26 May 1915. They are commemorated on the Le Touret Memorial which “commemorates over 13,400 British soldiers who were killed in this sector of the Western Front from the beginning of October 1914 to the eve of the Battle of Loos in late September 1915 and who have no known grave.” Frederick Sanger died of wounds on 8 August 1918 and was buried in Brockley cemetery. Given that he was in the same unit, it may well be that he was wounded at Festubert. His brother William Sanger was. On 26 May, William arrived at the 4th London Field Ambulance – one of the RAMC units for 47th Division – with a bayonet wound in his right thigh. Two days later he reached Number 9 General Hospital at Rouen, from where he was sent on to England on 29 May. Thankfully, William survived and recovered sufficiently to go to work. Instead of going back to the army, though, he was demobilised to work for mechanical engineering company Waygood Otis (forerunner of the modern Otis lifts company). He worked there from 1915 until March 1918, possibly at their works on Falmouth Road, SE1. While he was working for Waygood Otis, William married Emily Rose at St Jude’s Church in Peckham on Christmas Eve, 1916. Their daughter Doris was born in 1918. Between those two events, William was recalled to the army – in the wake of the German Spring Offensive of 1918, when men were desperately sought. His second stint of military service did not last long, though, and after two months and a transfer to the Machine Gun Corps (Motors) (i.e. tanks), he was discharged again in May 1918. William Sanger survived the war and died in 1960, aged 68. Just as in the more famous ‘pals’ battalions, men across the country joined up in 1914 (and indeed earlier) to serve with their friends and relatives. This was helpful for recruiting, but could be devastating when those units suffered heavy losses. In 1915, the Sanger and Rose families in South London must have felt the force of the war’s destructive powers; more happily, though, one of their young men did survive and lived a long life, bringing the families together in a wartime wedding in 1916.